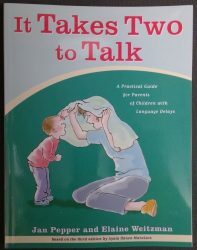 This new 2017 edition of It Takes Two to Talk gives parents the tools to make early language intervention a natural, ongoing part of everyday life with their child. 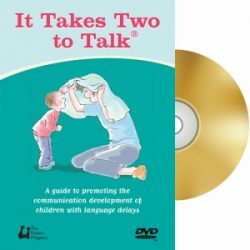 The It Takes Two to Talk® guidebook (Version 5 2017)and companion DVD offer a comprehensive, step-by-step learning experience for parents of children with language delays. Written in simple language and filled with colourful illustrations, the 171-page guidebook shows parents how to help their child communicate and learn language during everyday activities like mealtime, bath time, playtime and book reading. 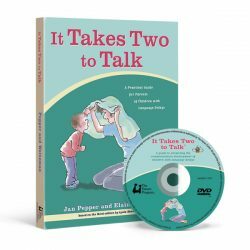 Each chapter of the It Takes Two to Talk guidebook has a corresponding section on the DVD where you can watch real-life examples of parents using the strategies with their children. Video examples include children at each stage of early language development, from those who communicate non-verbally to those who have begun to use short sentences. This makes it easy for you to “see” your child on the DVD, allowing you to quickly verify that you’re using the strategies correctly.